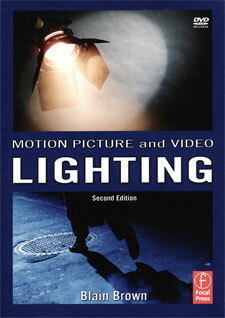 I have written several books about cinematography, film lighting, video lighting and filmmaking in general. These are some reviews of those books. © 2003 Rick Gerard and CreativeCOW.net. Blain Brown has created a masterpiece. 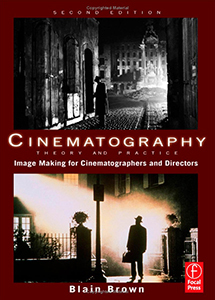 Cinematography: Image Making for Cinematographers, Directors, and Videographers is his third book and for the aspiring or experienced cinematographer  the best reference book I have ever seen. Anyone that aspires to this highest art of story telling should have this book on their shelf. He writes "At the heart of it, filmmaking is shooting, but cinematography is more than the mere act of photography. It is the process of taking ideas, words, actions, emotional subtext, tone and all other forms of non-verbal communication and rendering them in visual terms." Through both verbal metaphor and pictorial example he takes the keys to this art from their hiding place under the bed and hangs them right there on the peg on the kitchen wall. All you have to do is take them down and apply them. Learning the language of visual art is more than just learning the difference between subjective and objective camera angles, or knowing what the director means when he says he wants “a choker.” When you have finished the first chapter you will have a good enough handle on the terms a director and cinematographer bandy about on the set to sound like a pro. By the time you get to the fifth chapter “Cinematic Continuity” you will have been exposed to enough graduate level theory and practice to start you on the road to mastery of the form. I especially enjoyed Blain’s explanation and examples of continuity in chapter five. The next section of the book moves through every technical aspect of filmmaking from Exposure to Set Operations and Formats without ever forgetting to explain and theorize on the relationship between technique and story. Frames from films directed by Orson Welles, Stanley Kubrick and Akira Kurosawa are used and analyzed not as a model for their style of filmmaking but as examples of controlling every part of the frame to achieve an effect. As Mr. Brown says: not only do they serve as excellent examples of framing, composition, use of lens, blocking and color, but more importantly you know that nothing in the frame is an accident  it is easier to follow the choices that they made in order to serve the story." This is a “must have” book for anyone claiming to be a cinematographer that hasn’t got at least two Academy Awards sitting on their mantle. Well done Mister Brown. Well done. From the opening pages, I knew I was going to love this book. It is gourmet reading for the lighting connoisseur  a feast for those of us who love chiaroscuro, lightness, and dark. Author Blain Brown goes to great lengths to make this book as much about video as about film. Whenever he discusses a film technique, he makes sure to cover how it should apply to video as well. The chapters on lighting theory and practical applications really apply to each discipline. There's a brief history of lighting, which I found fascinating, followed by a detailed account of how the eye sees and the brain interprets images. But Brown goes beyond other books with a distinctive section on how light shapes our visual perception, and how we interpret the shape of our physical world by how light and shadows fall upon it. Make no mistake  this is a textbook, but an easy-to-digest one. The book is complete with chapters on electricity, lamps and sockets, and even basic gripology. There are plenty of photographs, graphs, diagrams, and data tables for handy reference. While the photographs in this book are the best of any of the books reviewed here, they still didn't quite get the job done. For instance, there is a series of color plates showing the subtle differences of diffusion materials such as tough frost and Hampshire, but it's hard to see much of a difference in the pictures. However, don't let this dissuade you from adding this excellent book to your library. San Francisco State, University of Texas- Austin, and Columbia (Chicago). decide on their books very early there. Story). Roger told me this book was exactly what his students need. Greg Mansur, Texas Christian University, Film Production, enrollment 36.
certainly augment my lecture and lab. Field Production course next fall as well as my directing course. printed. Kudos to you and Blain Brown. These books are available in English, Spanish, Italian, Mandarin, Japanese, Korean, Polish, Russian, Arabic, Turkish and Portugese.